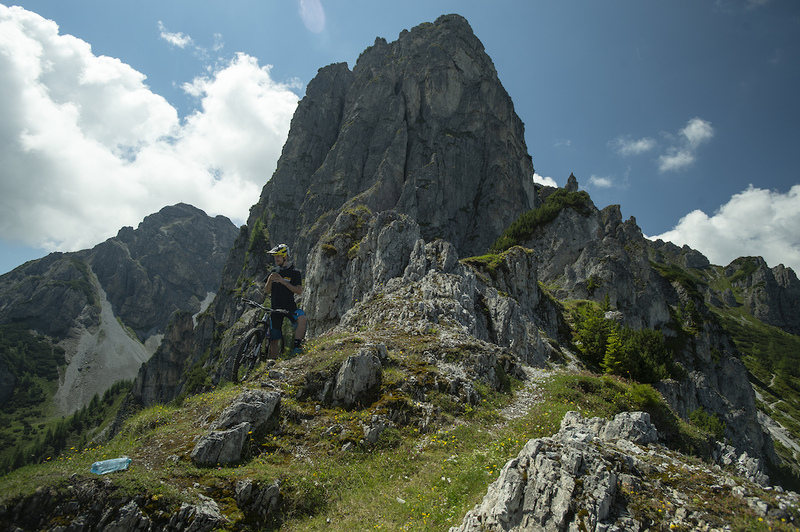 After Crankworx Innsbruck we decided to make the most of the awesome riding and sights within the area and set out with our rider David Trummer to film some downhill clips. After realising the lift was closed due to maintenance David resorts to his Propain Hugene 29er to power himself up the hill and has just as much fun on the way back down. Bikepark ripped us off big time. Went there on a friday on a roadtrip, liftpass was expensive for 5 trails. Rode 1 trail what was fun, than went to search the other trails. After 3 runs searching after it we heard that it was on a other lift what wasn't open. Payed full price for 5 trails, only could ride 1. Not a fan! It's like that since Crankworx came to IBK. The pricees got considerably worse. Still nice to have it, of course. funfact: They actually tell you that you've been riding two trails, since they split it up into two segments - an upper & a lower part. So if you'd split the segments into half again... you guessed it: 4 trails. marketing logic at it's finest..
That's actually the very lamest line you can find around IBK dunno why he doesn't ride anything of the good stuff. As well as ripping this other no-trail apart just for the sake of some not so boring shots is quite the a**hole move, really! There's already enough conflict between bikers, hikers, land owners and foresters... hundrets of years old hiking trails are eroding quickly if not ridden with some care. Götzens is the best around IBK! to be fair he left out the best, the lower part. But the top corners are realy good too. Insane grip wehen its wet. Upper Part in Mutters is nice too but it needs to be continued till the bottom. At the Moment you have to take the quite boring (after a few runs) flowtrail. Wow. Comment section just blowing this guy up... Bummer. I guess I'll jump on board with my criticism on this video...actually it's the majestic mountain scene picture.---an incredibly beautiful vista, and there you leave a plastic bottle in the frame. How? Why? It's just a reminder of how omnipresent the modern world is..that no matter where you go modern man has a way of f*cking things up! I hope you guys at least picked it up! WTF is a schralp? Is it like a cutty? Man, I’m so un-bro. Knee pads should be mandatory in PinkBike videos. Save us all from cringing throughout the video. So Schralp went mainstream?! That is so 1980s Santa Cruz skater speak. "Meeks was schralpin' Derby, dude"
@p2ryder: yeah that won't mean anything to anyone - oh well - can't edit. Sorry but I have to say this - shredding without ellbow AND kneepads - what a bozo! !